Black Friday has come and gone; amid the tales of super sales and throngs of people, stories were reported about injuries and fights. For me, saving a few bucks is not worth the lines, the waiting and the hustle. Whether we like it or not, the holiday season is upon us. In the Christian liturgical calendar (how the Church tells time) December 1 was the beginning of Advent. Advent is the season of waiting and expecting the coming of the Christ child on Christmas Day. Maybe it’s just me but it seems like every year Christmas decorations are being put up earlier and earlier thus losing the magic and the expectation that Advent has to bring. Children hold on to the magic, wonder and awe that comes with the season of Christmas. We adults, on the other hand, we tend make it a chore. It doesn’t have to be this way. Some people however are not satisfied with the notion that not everyone in the country celebrates Christmas or even promotes Christmas. The American Family Association believes that there is a full out “war on Christmas.” Well, I would have to say that they are correct but not for the reasons they postulate. The real “war on Christmas” is when Americans spend $450 BILLION on Christmas; however it would only take $20 Billion to ensure that all people in the world could have access to clean water for a year. This so called “war” is something that Christians every year are participating in but point the judgmental fingers at others. Don’t get me wrong I love Christmas and I love hearing the story of Christ coming to the world again. 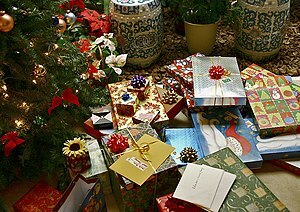 However the act of acquiring things should not be the central focus of Christmas. Neither is worrying about what catch phrase people say in a store. It is not the cashier’s job to share the Church’s story of God coming to the world. This story of the incarnation of God is MY story to tell, the Church’s story to tell, all of Christ’s followers story to tell. Christmas has the power to make a difference in the world today. Imagine what we could do if we chose this Christmas to share our love in ways that cannot be wrapped and placed under a tree. What if we took some of the money that we would have spent on each other and gave it to people who were in need– then Christmas could change the world. So let’s call a metaphoric “cease fire” and stop this so-called war on Christmas. The Mayor of Houston has been receiving some “constructive criticism” regarding a tweet that she posted a few days ago. About 10 days or so before HALLOWEEN, I began to see some shops and stores put up their Christmas decorations. See the tweet below. Stores here in Houston have stated that they have to do whatever is necessary to make sure they make their Christmas profits. That’s right… Christmas profits. I am all for businesses doing well so they can make a living, that is the American dream. But I am not for making a religious holiday into an opportunity to overspend. It is much more than about gifts and presents and overeating, it is a remembrance of the birth of Jesus Christ. Personally I have no problems with her comments; having Christmas decorations up two months prior to the event is ridiculous. These decorations were up before Halloween and Thanksgiving and so called “Black Friday.” At this rate we should keep Christmas decorations up all year. Here’s to Annise Parker and I hope you are looking forward to Thanksgiving, the forgotten holiday.